Hot project for a cold beer. – Dirty wet dog , boats and sailing. This is the last project that i’m going to start in this years spring refit : making a new ice-chest/coolbox for WABI”’. I am almost up the point of finishing projects, stowing the boat, putting clothes and food aboard and actually getting out there. Everything has got slowed down a lot by the weather here : as i write it’s raining sideways and blowing a full gale even in the lee of high ground here. On days like these i doubt that anyone is getting jobs done down at the yard, mind you the yard doesn’t really wake up until Chris the boss starts throwing boats back in…..any week now. As i write it seems to be not just April fool day, or even week, but totally bloody stupid April idiot time. Just to explain, i live in a small village in the Tamar valley and my nearest useful town is Tavistock , a few miles to our east but significantly on the other side of the Tamar river. The Tamar is only cross-able at a single track bridge, at the small village of Gunnislake and the bridge itself is not only officially an ancient monument but represents a very tight turn in the road. Because it is single track there are regular confrontations over who has rights of way and last year it was completely closed for several weeks when some muppett borrowed his boss’s van after a few drinks and managed to put it through the parapet and into the river…..lucky for him that the van landed right way up ! Last week we were on our way back from the dark side (Devon) having dropped my truck off for it’s MOT and some work, had breakfast in Tavistock and were all-but home when we got to the bridge and found it closed…..a nice police blokey telling us that there was a prang and that the bridge was both closed (again) and badly damaged. Almost within sight of home we had to turn around and drive a 25 mile detour essentially upstream to the next Tamar crossing. Since then it’s been a total ball-ache, to get my car back after it’s MOT i had to walk to the local train station, catch train into Plymouth, bus to the hospital and then catch a second bus most of the way back towards home and then take a long walk across the moor to get to the garage…..sleeting lightly by the way. Then when i got the car, and the bill…..ouch…i then had to drive back to Plymouth, found the main route into Cornwall completely blocked by another accident…..at peak traffic time….and then drive all the way back the way i had come to take the alternative route home. That was a total of 6 hours to do what should have been an hour’s job at the most. I’m up to the point of sorting out the heads compartment, it’s not a heads any more as i stripped the sea toilet out when i first bought the boat and that’s still sitting in the corner of the workshop…last time i looked there was good evidence of spiders and cobwebs in the bowl. For most of the time that iv’e had WABI”’ the heads compartment is where we store the water containers, hang our waterproofs and where the previous cold-box used to live. Some of you might remember the one i made for the cabin on Inanda which also served duty as my chart table. That was the ‘wanigan’ project in case anyone new is interested. That now serves as our food crate when we go off car camping. The wanigan while it worked well enough as a cool-box and better as general duty table aboard Inanda didn’t have enough volume in the ‘cold’ side….i split it into a wet (cold) side and a dry side which we used as our day larder. I couldn’t give it much insulation either so ice didn’t stay frozen for very long. In the old one there’s only 25mm of insulation all round which isn’t enough and even with that there isn’t really much ‘cold’ volume. The new one is about the same volume although a different shape, taller, which i believe is more efficient in terms of retaining a ‘cold’ mass. Also, it’s not divided into 2 smaller sections, the whole volume being a cold box. Old version after a clean out. Today i set to with whatever scrap materials i could find to start building the new one. I knew that a specific size of stacking crate (42 litre) has almost the perfect size and shape that 2 of them will sit together on the heads step. I also had one of those crates kicking around without a lid that normally lives in the truck and gets filled with whatever loose project stuff is going to and from the boat. Rather than measuring the size and starting to build in scrap plywood as per usual i just went straight into the new build by using the crate as the box and immediately fitting panels of insulation (recticel) inside. I had most of a sheet of 25 mm Recticel left over and while it’s not what i had in mind, i wanted to double the insulation, i had enough to stack-laminate and use 2 layers for the sides and 3 on the bottom. The top will actually be taken from a slab of 50mm insulation i have kicking around. Also, as projects go, i decided that it had to be done from materials that i had in the workshop and i had to get it done in a weekend : ideally in a day !. The build is very simple : basically a stack laminate of 2 layers of recticel insulation board around the outside, 3 on the bottom and with a simple , thin , plywood liner coated with epoxy resin. That meant working with some ‘fast and dirty’ techniques so the insulating box is primarily held together by being a hard interference fit in the crate and the upper part , which isn’t supported by the crate, is taped together hard with good old gaffer tape. The new coolbox and the wanigan. The top/lid. The inner, insulated box has a closed part at the top and about half the area which can be lifted out, that’s then also insulated and covered with a layer of soft camping mat. I created a cold seal to some extent with layers of camping mat glued to the top of the inner and then a layer glued into the outer lid. The end result is a lot lighter than the old one…by a factor of at least 4 times. That will make the new one a lot easier to handle and to be honest it doesn’t have to be ‘pretty’ in any way…..just functional. I did wonder if it would be possible at the end of the build to pop the insulated box out and then cover it with epoxy/glass. 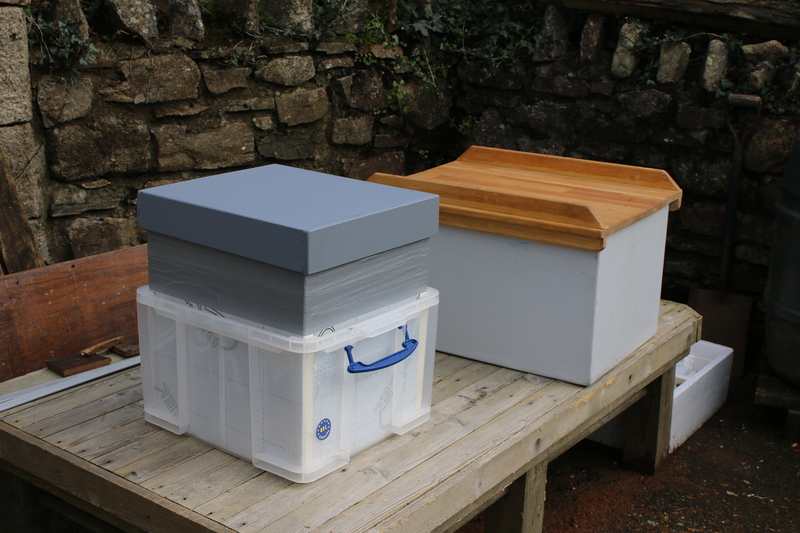 Two things happened though : i’d made the fit so tight that the insulated box wouldn’t come out easily and secondly i had just about run out of epoxy resin. That crate does also fit the space so there was no good reason why i shouldn’t use it as it is. It looks a bit odd but again, it’s functional. As projects go it’s about as rough and ready as is possible although it does seem to be completely functional and that’s what counts at this stage. During the build i discovered that peculiar phenomenon again that is , that by building something quickly i learn far more about how to build a much better one . I have only ever once been involved in a boatbuilding project that used structural foam core and glass. I think the foam boards all came from a local company who sell epoxy and GRP products but they don’t stock the material any more. I did find a supplier who stocks 50mm board and thought to buy enough of that to build a new one from scratch….maybe with a glassed outer and a proper welded plastic liner but given the costs of other things this month….car costs etc it will have to wait until the next cycle of projects. Previous Hook, line and sinker. Next One for the creek, one for the shed and one for the weekend. The T-34 of coolboxes Steve — function over aesthetic niceties — I like it. Coincidentally I’ve just used an old plastic staking crate to build a “hutch” for next doors smelly old Tom cat, with the addition of a bit of scrap OSB and some left-over roofing felt to make a nice overhanging roof and an old cushion rather than Recticel for insulation. He’s very happy in it in the corner of my garden sheltering from the cold wind and April showers. Our man in New Zealand calls it ‘available parts technology’ …..if it can’t be done with baling wire and/or gaffa tape it’s probably not worth the effort. Reminds me to put some good old no 8 baling wire and a new role of gaffa tape on the boat. Like it. Can’t go far wrong with wire and gaffa tape.